This is the mesecons [=minecraft redstone] mod! 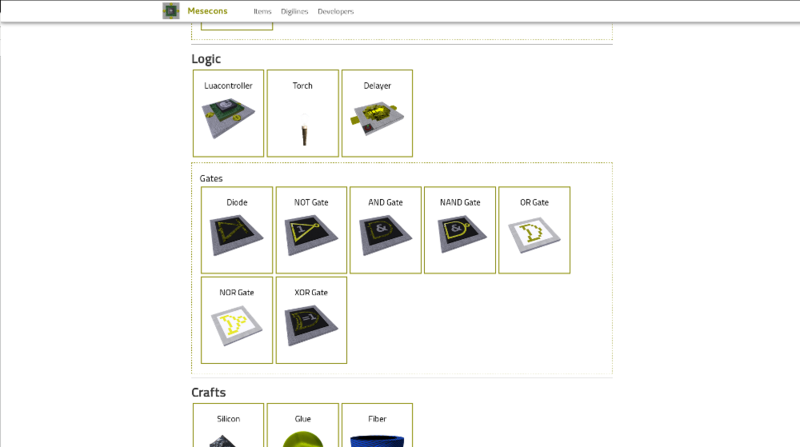 Mesecons adds everything digital, from all kinds of sensors, switches, solar panels, detectors, pistons, lamps, sound blocks to advanced digital circuitry like logic gates and programmable blocks. 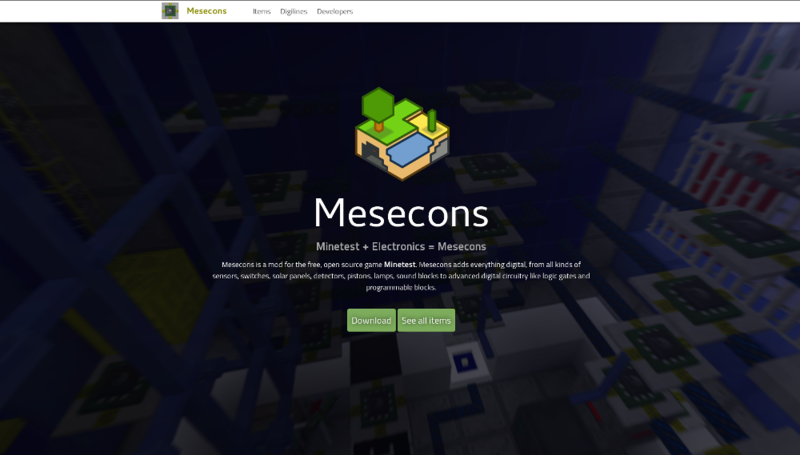 Check out the mesecons website! There you will find all the information and documentation! If someone wants to help me develop mesecons have a look at the developer documentation on the website. You can commit your changes on GitHub. Last edited by Jeija on Tue Apr 04, 2017 19:13, edited 4 times in total. Nice. I like the use of plants for power. make torches! like minecraft mese torches! so that it can be used on a side block..but if a mese wire is attached to the block that has a mese torch on it it turns the torch off! Awesome. I'm going to try to make logic gates and memory cells with either water, turbines, and movers or solar cells and movers. DO NOT MAKE MESE TORCHES!!! thats stupid. water Turbines and solar panels are more cool and realistic! Great mod! Does this mod use lot of CPU time? Last edited by hurufu on Sun Dec 25, 2011 13:36, edited 1 time in total. When movestone moves a mesecon_*, it remains in the same state. For example: when I move mesecon_on it remains mesecon_on even when it's not powered up anymore. Last edited by jordan4ibanez on Sun Dec 25, 2011 15:47, edited 1 time in total. It can be gate or memory or delay or breaker or %thing% block. not a mese torch. 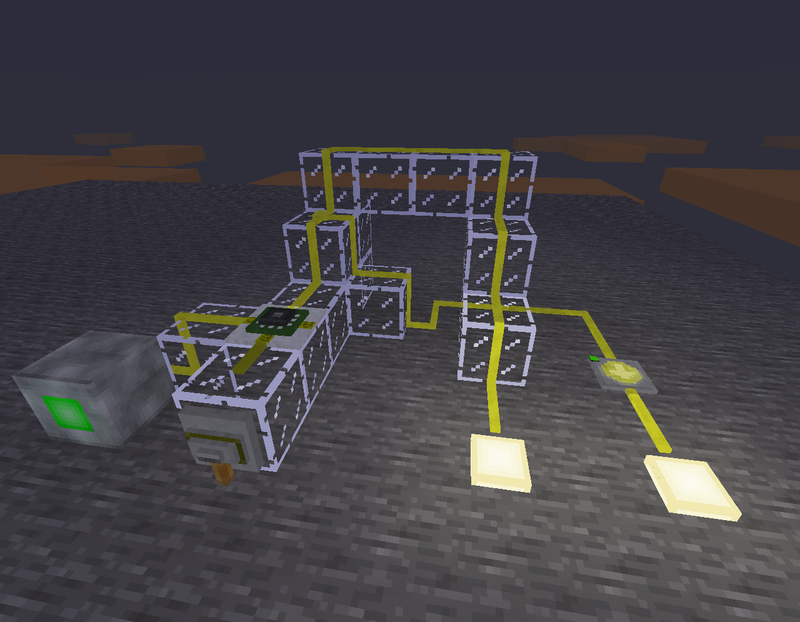 This gives you the possibility to create even more circuits/gates. I already planned this before releasing the first version, but it wasn't ready. It will take like one second to transmit (using abm, so transmission speed may vary). 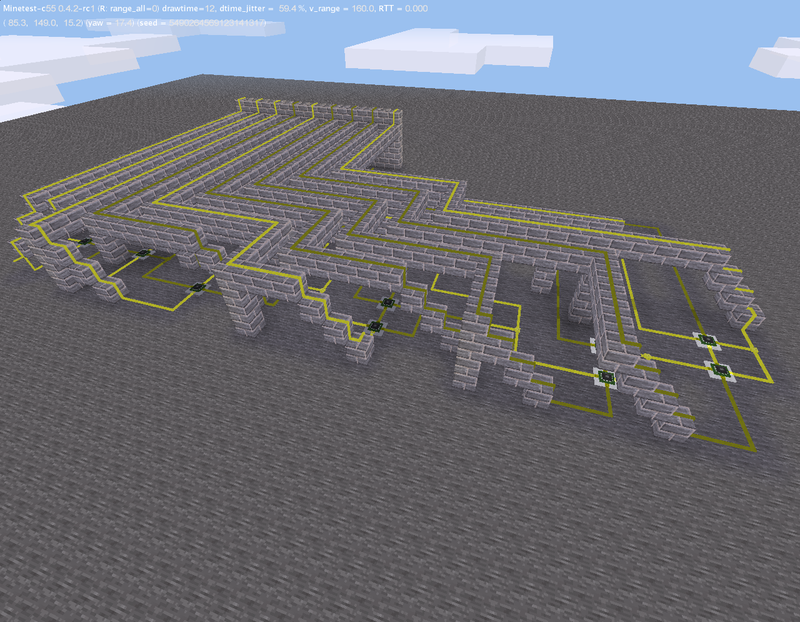 I think this will give you the ability to create more logic gates (although I'm not a redstone expert). I'm not sure about this one... I think it will be quite difficult to create a function that adds a timeout for a button to switch off again. I only know abms and they don't work as I'd like them to. The switch off time would be random when using abms, and for rendering buttons I would have to use a patched version of minetest or (even worse) use entities for it. But I love the button idea! I'll implement it as soon as it is possible. I know this bug and I thought about fixing it, but in fact I think this is not an issue of my mod, but even more a common minetest issue. The register_on_placenode function should be called each time a block is added, not only when a player adds it. I'd really like if someone could fix it, else I have to get to know the c++ code better and fix it on my own. As you can see in my first post, I requested even more functionality for the modding api. I also think pressure plates are really necessary, or even better, if I can set and get the orientation (rotation) of a block, I could add light barriers. Keep on filing bugs and requesting items!!! You may also commit textures, items, whatever. DUDE I love you for this. This mod makes the game amazing im getting a lot ideas in my head right now. + Your mod is making me upgrade my minetest version :) Thanks man you are purely awesome !!! I thought in the same way, it's sad. When two movestones are moving towards each other and there is another block between them, it disapears. Great. Waiting for this to be added to upstream. I'm going to release it when it is completely stable, certainly today. I haven't seen that bug before, thank you for filing it!!! Could you please give me some more detailed information about it? How are the blocks arranged and so on. By the way: Is there any function that is called when the server is created where I can acces minetest.env from? Else, I'll use the register_on_newplayer function for now, so that blink circuits continue blink on reload of the world. Last edited by Jeija on Mon Dec 26, 2011 11:11, edited 1 time in total. Jeija wrote: Could you please give me some more detailed information about it? How are the blocks arranged and so on. I think that's happen because of absence of entity collision detection, therefore when two or more entities are at the same pos all added nodes have the same position too → we see only one added node → other nodes seem to “disapear”. One MESE should make 32 and not 16 mesecons... MESE is very rare, keep in mind. Calinou wrote: One MESE should make 32 and not 16 mesecons... MESE is very rare, keep in mind. Not that rare at all just teleport or digg very deep and find a cave ... VERY EASY!! I'd make mesecons like a block, not a line. Then you wouldn't need to worry about it's direction. Off - like glass plus some color. On - like off, but some light. Or make it green/red when on/off. @Neko259: I don't think blocks look good and i think you should be able to walk through mesecons. But if you like blocks better, just modify it and post your own fork. @Calinou: As Staffs already said, mese is not that rare... But if others also think that I should make 33 (not 32 cause 99 can be divided by 33) instead of 16, tell me and I'll change that. @hurufu: I fixed the movestone bug! Thx again for filing it. --> The old mesecon buttons will be shown as unknown blocks. Just replace them with the new ones. From now this mod also needs to send some information to a file called mesecon_data. This means, that you have to have write permission there! It should be placed in same folder as the binary, but in future version you will be able to change that to your own folder. See my post up there for crafting recipes and the download link. Keep Filing Bugs, sending in textures and giving me inspiration! I'm very curious about what you can do using inverters, so please upload pictures/maps/whatever of your creations! Last edited by Jeija on Tue Dec 27, 2011 07:01, edited 1 time in total. Turn on your server, jordan, I'm currently fixing it. Last edited by Jeija on Tue Dec 27, 2011 07:33, edited 1 time in total.